With every party, aesthetics is important.Yet, paramount to most party planning – is cost. Each table should be decorated with a theme of colors and/or genre.Whether it is a Hawaiian Luau or a graduation party – an overall theme should exist. Part of each table decoration often includes balloons or other lightweight decorations that need some kind of weight to keep them in place. Sure, you can purchase those balloon weights at your dollar store. But as the table count goes up, so does the cost. 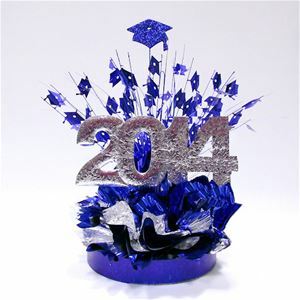 Being the frugal gal, I thought of several ways to hold down the graduation caps for an upcoming graduation party. With 10+ tables to dress, I needed to consider what would travel easy and look good – even if the caps were lifted by curious guests. For previous parties I’ve made my own weights using Plaster of Paris in a variety of containers: decorative Chinese food boxes, decorator cups, mini flower pots, etc. For this event, having to deal with the mess of preparing the mix along with the added drying time, just didn’t appeal to me. This is when it struck – why not fill balloons with play sand or better yet – the more inexpensive counterpart – salt? It worked like a charm. It cost only $1.50 per 11 weights and it took less than an hour of working the salt into the balloons. Since these were not going to be seen in generally, it was the easiest and most inexpensive solution. Three items are needed to make balloon or table decoration weights. The cost for 11 weights: $1.50. Image courtesy of Debbie Morrow, all rights reserved. *Before deviating from instructions read my funny disaster that occurred when attempting to quicken the process below the numbered directions, so it doesn’t happen to you! Place the tip of the balloon on end of funnel. Pour approx. ¼ cup of salt into funnel, while continuing to hold the balloon tip to the funnel tip. Once the balloon has stopped allowing salt to enter it, start stroking the “neck” of the balloon, pushing the salt downward. Continue pushing down on balloon bulb until salt is completely out of the funnel and tie a knot in the end of the balloon. While I was stroking the first balloon, I was thinking how I could make the process go a bit faster. 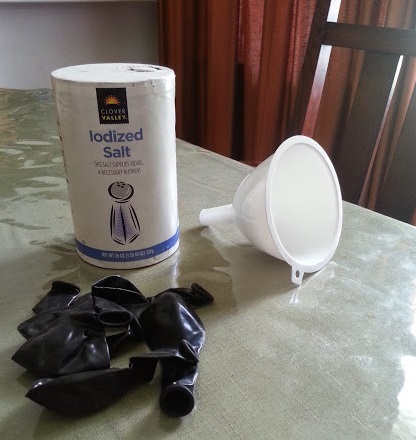 So I thought: Why not blow the balloon up, place it on the funnel tightly (so the air does not escape) and then pore the salt into the funnel? With the balloon already stretched, it would be a quick process. WRONG MOVE! What I didn’t realize was the pressure of the air once released would make the salt jet out like an instant blizzard of salt all over me and anywhere within 4 feet. I couldn’t help but laugh at my mishap and share it. So just take the few extra minutes – stroke them instead of hoping to speed the process. If you have another way of filling balloons with salt/sand I’d love to hear it – especially the mishaps. Using Mylar grade balloons is recommended for strength in making these weights. Image courtesy of Debbie Morrow, all rights reserved. Use tissue paper and ribbon to dress up these weights if they will be seen and not hidden under a prop. If you don’t plan on having another huge party afterwards, you can use the salt later for many things: colored salt art, salt dough recipes, weed/mushroom killer, and more. I hope your party is a success! 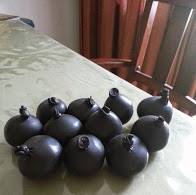 This entry was posted in Party Ideas, Props, Uncategorized and tagged Balloon, DIY, Easy, Inexpensive, Table Decorations, Weights by thewritegirlforthejob. Bookmark the permalink.